Johann Mattheson is mainly known as theorist and writer of books about music. But he was also a productive composer. The largest part of his output is vocal music, both sacred and secular. The former he composed mainly in his capacity as cantor of Hamburg Cathedral, a position he held from 1715 to 1728. In that year he had to leave his job due to his progressive deafness. The Cathedral had a special status in Hamburg. Unlike the other churches it was not under the supervision of the city council and as a result it had a considerable amount of freedom. Mattheson used this freedom to the full. He insisted on using new texts for religious compositions. Even more revolutionary was that he used women in liturgical music, which was absolutely not done everywhere else. And he also made use of the singers who worked for the Hamburg opera which the ecclesiastical authorities considered a cesspool of vice. The participation of opera singers in the performance of religious music in the Cathedral is an indication of Mattheson's preference for sacred music of a theatrical nature. 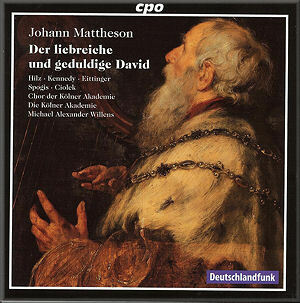 This explains an oratorio like the present, Der liebreiche und geduldige David, which is one of the last Mattheson has and which dates from 1724. It concentrates on the revolt of David's son Absalom and his defeat. As usual it is in two parts, which were performed before and after the sermon respectively. The main role is that of David; Absalom doesn't figure here at all. The second main role is Meditatio, an allegorical character who at first opposes David and then supports him and comments on the events. The first parts tells about the start of the uprising when David has to flee. Meditatio urges God's revenge but David says God wants us to love our children. When Simei, who belongs to the family of David's predecessor Saul, curses him, David resists any attempts to punish him as he believes "that God commands him to do so". At the end of the first part Meditatio understands that David takes his love from God's love, and then urges the 'Christian Community' to sing: "Let us increase in your love and knowledge, that we may remain in faith and serve you in the spirit." The second part begins with David's army fighting Absalom and his men. David urges his soldiers to spare Absalom's life. But at the end of the battle he learns that Absalom has been killed, and then sings a song of mourning: "Oh, Absalom, my son!" Meditatio reacts in a recitativo accompagnato: "Now I'm completely convinced that neighbourly love arises from God's love". He also points in the direction of Jesus: "What David did, that Jesus does no less". This is underlined by the chorale which ends the oratorio, a stanza from the hymn 'Wie schön leuchtet der Morgenstern', associated with the Annunciation. The instrumental scoring is for strings, two flutes, oboe, two bassoons, two horns and bc. The horns only play in one aria in the first part and the war chorus at the start of the second part. The other wind instruments have some obbligato parts, but they mainly play unisono with the voice. There is little instrumental virtuosity in this work, with the exception of the obbligato part for the violin in Meditatio's aria which opens the second part. Mattheson was a supporter of the modern style which emphasized the importance of melody instead of harmony. This is reflected by this oratorio. There are no harmonically remarkable passages, and expression is mainly achieved through the melodic lines. The duet of Ithai and Abisai in the second part (Gott ist es der für alle Menschen wacht) is typical of this work: the two voices mainly sing in parallel motion. I haven't heard many of Mattheson's vocal works. Years ago I had the opportunity to hear performances of operas by Mattheson and his colleague Reinhard Keiser, and I came to the conclusion that Keiser was the better composer. This oratorio confirms my impression. 'Der liebreiche und geduldige David' is a nice work, but there was hardly anything which really struck me as remarkable. David's lament "Oh, Absalom, my son!" is rather flat and not very expressive. But that is also due to the performance. I don't understand why in this aria the basso continuo is played by the theorbo alone. The use of the organ and the cello would have imparted more colour to the performance, especially as Christian Hilz is not the most expressive singer of the cast. There is nothing wrong with his singing as such, but his voice is rather bland and lacks colour. The most interesting part is that of Meditatio, and with Nicky Kennedy it is very well cast. Ursula Eittinger has a small role as Simei; in her only aria she could do with more bite. Max Ciolek is alright as Ithai, but unfortunately in his aria 'Heldenkönig, deine Schmerzen' his voice wobbles on every longer note. The soloists are also part of the choir which is extended to eight singers in total. The blending of the voices is less than ideal which is especially noticeable in the chorales. The orchestra does play well in the tutti and in the obbligato parts; the natural horns should be mentioned with honour. To sum it up: it is interesting to become acquainted with Mattheson's vocal music, and those who have a special engagement with the musical life in Hamburg in the early 18th century shouldn't miss this disc. If the part of David had been given a more expressive performance I would have commended it to a wider range of baroque enthusiasts. Even so I think the vocal works of Reinhard Keiser are in more urgent need of exploration.